Beech (Fagus Sylvatica Lynnaeus) is a species of beautiful, deciduous tree, with a smooth, greyish bark, native to certain parts of Europe -with a warmer climate-, Asia and North America. Its leaves are loosely toothed and hairy in spring, and the tree bears both male and female flowers on the same specimen; the small ones are unisexual, the female flowers bloom in pairs, and the male ones are anemophilous aments (cylindrical clusters of very tiny flowers). Flowers are produced in spring, once the leaves have already appeared. Its fruits (beechnuts) are edible and have a high tannin content. In the autumn, if you are trekking in the forest, it is easy to see the brown dried beechnuts on the ground. We call this tree haya in Spain, and the fruits are known as hayucos. 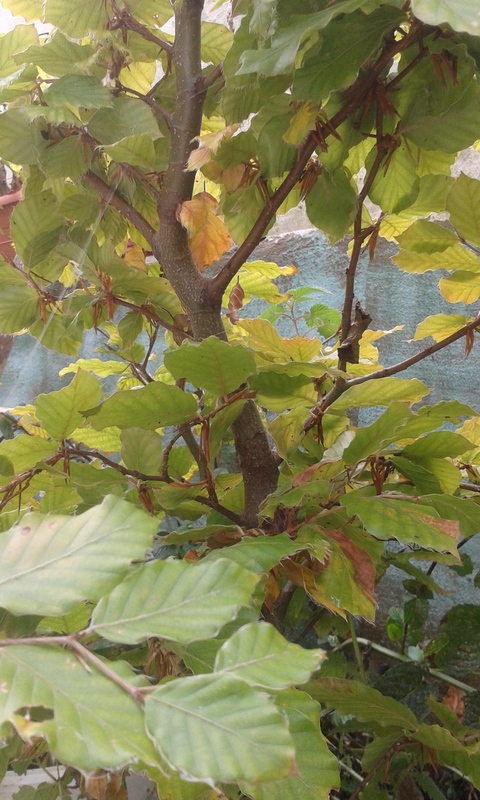 The name of the tree (Latin fagus) is of Indo-European origin, and played an important role in early debates on the geographical origins of the Indo-European people. And that is the aspect of beech trees that interests me today. Within Europe, the common beech is restricted to central Europe, and it is not native east of Poland and Ukraine. The two main branches of Indo-European fall in either side of the line drawn by the imaginary line from Scandinavia to Greece -the Fagus line-, which splits Europe in two. Those two branches are known as the Centum group -the name comes from the word for “one hundred” in Latin- and the Satem group -from “one hundred” in Avestan-. The Centum group, West of the Fagus line, comprises Hellenic -although Greek φηγός, from the same root, was transferred to the oak tree (e.g. Odyssey & Iliad) as a result of the absence of beech trees in Greece– Italic, Germanic and Celtic. The Satem group comprises Indian, Iranian, Armenian, Balto-Slavic and Albanian. The Fagus line theory depends on the existence of beech trees in the area as evidence by the vocabulary. For instance, in the Centum area, there are no ancient work for elephant, camel, lion, tiger or bamboo, but there are terms for freezing cold, oak, beech, pine, birch, willow, bear, wolf, otter, beaver, polecat and bee. There is an exception though, Tocharian -belonging to the Centum group, as fragmentary texts have been found in West China. Nomads? Immigrants? A flawed theory?